I started making these a few weeks ago for myself as a snack and the kids asked to try it. They have seriously had one almost every day since. They are super easy to make and relatively healthy. This is great because my kids come home from school HANGRY and want something ready before I pick them up. 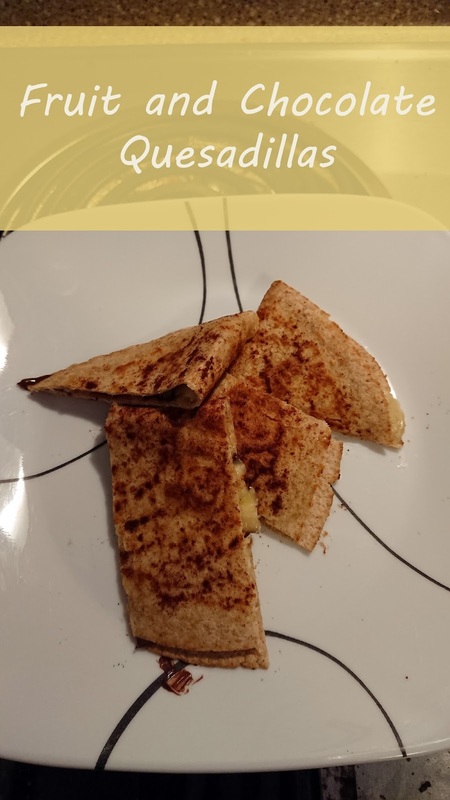 All you do is spread some butter and sprinkle cinnamon on the outside of the quesadilla, place in hot skillet, then put thin fruit slices with chocolate chips on the inside, melt the chocolate and you're done. I've only used apples and bananas but you could use whatever fruit you want really. I've also added marshmallows sometimes too. My son is super picky so getting him to willingly eat fruit or veggies in any form is a win. Spread butter or margarine on one side of tortilla, sprinkle cinnamon and place in hot skillet buttered side down. Place fruit slices ans chocolate chips on one half or the tortilla and fold the other half on top. Heat through then flip to heat other side. Cameron is nine months old today. Just three more to go until he's one. I say this every time but it blows my mind. This past year, while much harder than I imagined has been a whirlwind. Now that we're going into spring (maybe - we had snow and ice earlier this week!) I'm starting to plan my garden, enjoy the outdoors more and really start planning someone's first birthday. Eek! Little man is currently sick with a cold and pretty grouchy. A couple nights ago he had a barking cough and fever so I think it's actually croup. I was able to get a few smiles this morning though. He is normally super happy so I know he doesn't feel good, poor guy. He is very slowly Army crawling, but only when he's really motivated for something. I keep waiting for him to just take off but maybe he'll be one of those kids who skips crawling? Who knows. He still loves food and gets mad when you eat in front of him. At my in-laws last weekend my mother-in-law gave Ewan a sandwich and boy did Cameron not like that. He cut his third tooth and it looks like at least one more will be coming soon. He definitely has some separation anxiety and I have to be within reach at pretty much all times. He babbles all the time but when he sees someone he doesn't know he just stares. It cracks me up at the grocery because you can hear him throughout the store but when the cashier tries to talk to him, silence. We're taking the kids to Washington D.C. over spring break so it'll be interesting to see how he does on the trip. The rest of us are super excited though! 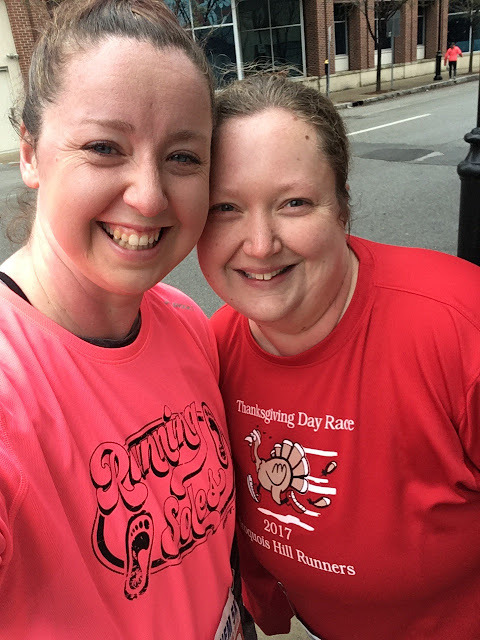 This past Saturday I ran the Anthem 5k in Louisville with a friend of mine. We ran it together back in 2016 too. Back then it was her first race postpartum and while this technically wasn't my first postpartum race, I consider it to be because the Thanksgiving Day race I did was accidental since I missed the turn around for the one mile. I came into this race with no expectations because while I have been running regularly and training for a couple ten milers and a half coming up this spring, it's been super hard. I really just wanted to finish and have fun spending time with my friend. This year they did corrals based on the predicted finish time you put and we got put into the second to last corral. No biggie we thought as we lined up. Until we noticed what appeared to be walkers all around us. We slowly started inching forward and to the sides because we knew we were going to have to dodge them. And boy did we! We spend the entire race dodging walkers, some of whom were walking the entire width of the street. Which for those of you non runners, is super annoying and really bad etiquette. Our official time was 43:16 with a pace of 13:56, but it's not really accurate. That's based on running 3.1 miles, when according to my watch I ran 3.24 miles in 43:22 with a pace of 13:22 a mile. The discrepancy is because of all the weaving. We had a lot of fun catching up and will be running the first of my 10 milers together in April, also in Louisville. I didn't take any photos but my friend loves selfies, so here's one of us after the race.